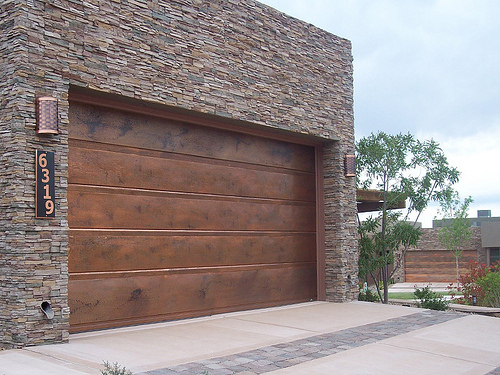 Photo of a flushline copper garage door by carywaynepeterson/Flickr. If you haven’t gone shopping in a while, you might be surprised by how challenging picking the right garage door can be. An explosion of styles, colors, and options have flooded the market, which is great news for homeowners who want the perfect product, but not so great when you’re standing in the aisle of the home supply store scratching your head. And those are just the stock products; at that point, you haven’t even explored custom and semi-custom options, which expand your choices even further. The first thing to do is take a few deep breaths and jot down some notes about the profile of your garage. How do you use the space? Some people use garages just for parking cars, while others may store items (implying the need for security) or use a garage as a workshop, playroom, or band practice space. All of these uses speak to different needs that should be considered. For example, if people are regularly in the space, you need an insulated door; and if you’ve got a rock band, you might want to think about soundproofing. You should also consider the visibility of the door and its aesthetic impact. If it faces the street, you might want a model with windows that will add light to the garage and break up the bulky, blocky look to make it more visually interesting. You could also consider paneling and other decorative accents on the door to make it more dynamic; and consider how it will blend with your house, as well. If you have a sleek modern home, you’ll want a very different garage door than a highly traditional Victorian or Edwardian-style home. Garage doors come in classic roll-up styles along with options that fold open, swing open, or work on runners to slide out or past each other in a carriage door style. The best profile to consider depends on the footprint of your garage and the surroundings. You may have limited space, in which case you probably need a door that swings or folds up to avoid problems; a garage door that opens outwards or slides might run into landscaping, the neighbors’, or even your own house! As you narrow down the style of door and what you want it to look like, along with how much insulation you’ll need, you should also consider safety and security. Many garage doors are designed to lock, but they offer varying degrees of security. If your garage connects to your house or you use it to store valuable equipment, you’ll want to make sure the door is very secure. Furthermore, you might want to consider safety features like pinch guards, safety stops, and springs specifically designed to reduce the load of the door so it will be easy to open and close. In addition to making being around the garage safer for you and your family, these can add value, as prospective buyers in the event you sell your home might appreciate that attention to detail, especially if they have young children or slightly-built family members who might struggle with the weight of a conventional garage door. Another thing you may want to consider doing when picking the right garage door is wandering around the community to check out various doors in action. You could learn more about how various styles look in real life, not just in the store, and accommodating homeowners can tell you more about where they got their garage doors so you can generate ideas for sources and companies that could handle installation. Ultimately, you may want to consider a semi-custom design that allows you to assemble all the features you want in one door, or an architect-designed custom that’s ideally suited to your home. Such doors are more expensive, but they’re also built to last, and they’re less likely to cause a case of buyer’s remorse because they’ll have all the design features you needed, and they should look stunning.